Can you scan some covers? I want to buy one of them! Another interesting, I only see ISS 1 version. Will try and post pictures if anyone wants them. Yes we want it! Thanks! Thanks for the welcome. Yup - I will scan the covers for you - do you want them all and what resolution do you want? I will send the copy of Raid to you tomorrow !! I've attached some pictures for now - will try and take some better ones soon. 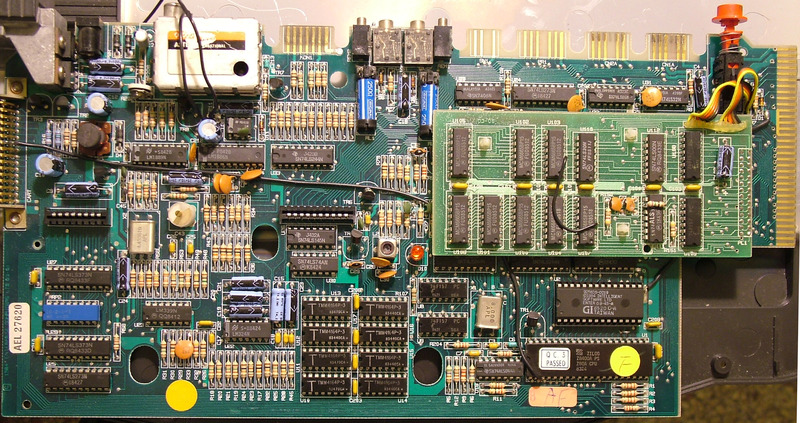 The PC power supply used for the 4 floppy drives and with 9V converter to the EP. The machine is overclocked to 7.12Mhz. Rewired PC keyboard connected to the EP, for care the keyboard membrane. 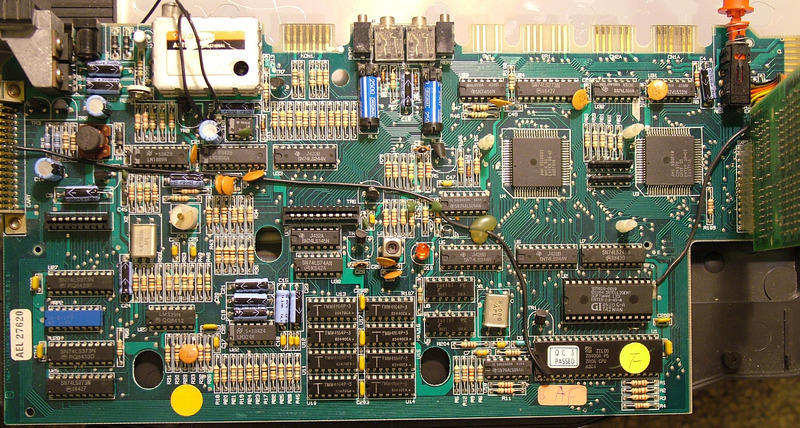 The EXDOS card overclocked to 16Mhz for handling HD disks. Yup - I will scan the covers for you - do you want them all and what resolution do you want? Please 300DPI or better. I writed my email address for you. I will send the copy of Raid to you tomorrow !! Probably this is a very early, when no printed labels? Do you opened it, what is in the box? 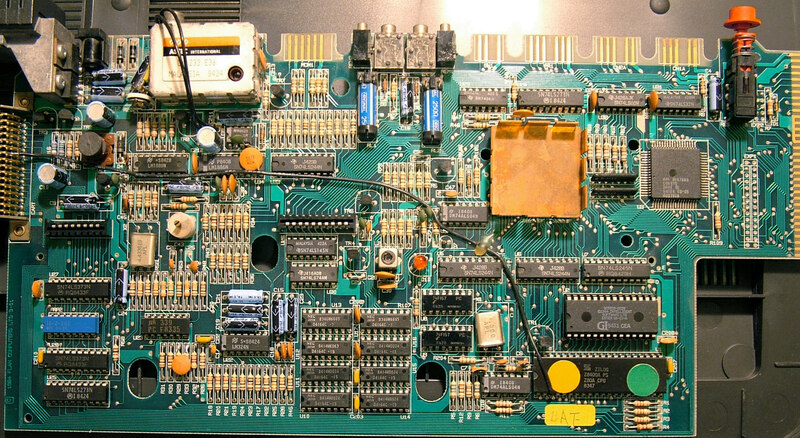 All know EP128 have a ISSUE 6 motherboards. Most of EP64 have a ISSUE 5, but I have one EP64 (arabic) which are have ISSUE 4. 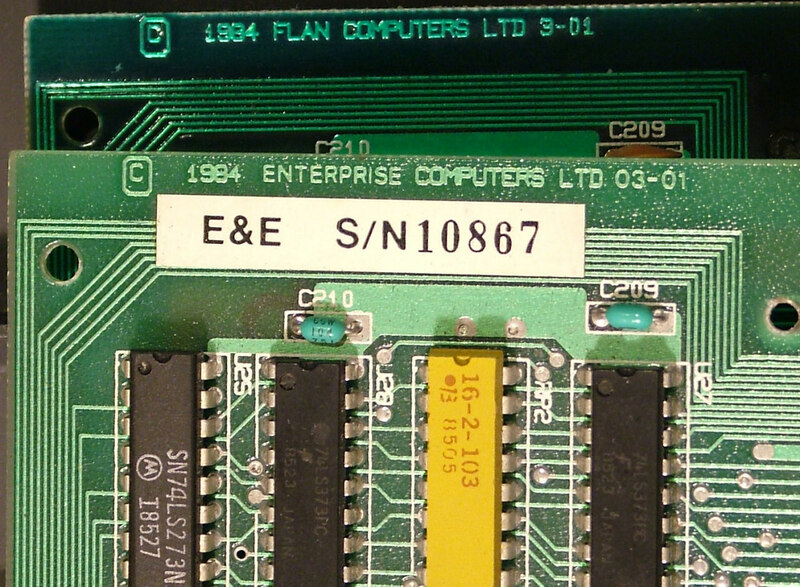 It is very interesting because the name on the PCB is a FLAN! Older than ISSUE 4 currently not know. At this photo I not see any difference with the EXDOS cards. Can you compare your card with these photos? Sorry to go off topic - but im assuming that you want the manuals to Spectrum Basic Converter, Fantasia Diamond, Collosal Adventure, Spanish Gold, Chains, Dictator and Devils Lair as well as the covers? EP128 - great setup - do you have any info (in English im afraid ) on how to use a PC keyboard with an Enterprise? Just thought I would add my config (sorry no pics at the moment) since this is my first post here. In the meantime - thanks for the site - loads of great Enterprise stuff - just wish I could read Hungarian !!! We have some volunteers to translate the important and interesting informations to English (see our Wiki ), but it is a huge task. For serious: anyone who speak English could help in the translation with proofreading the translated texts and fixing the possible grammatical errors and typos. From a quick look - I cant see any circuit board changes on my disk controller on the top, however the bottom is slightly different - instead of saying "1786" - mine says "0686" and the there are no components on the bottom (i.e. no resistor etc.). From memory I cant remember the motherboard issue number but it does say "1984 Flan Computers" on it. Last question, is it possible to get replacement keyboard membranes anywhere? P.s. MrPrise - I am happy to help with proof reading translations and sorting grammatical errors and typos etc. it does say "1984 Flan Computers" on it. Wow! In your EP128?! Very interesting! 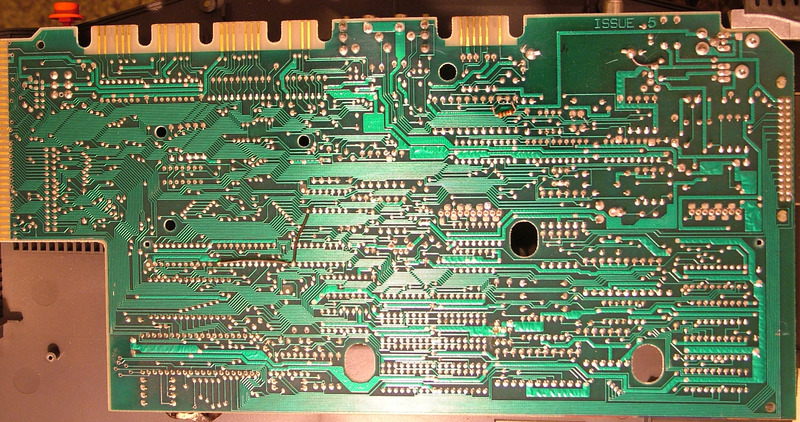 This menas it is a ISSUE 4 or older mother board! I think your EP128 is a very-very early!!! Or other tip: originaly come as EP64, but later expanded to EP128 in a official Enterprise Service. We know from the scanned english magazines (thanks for Bagpuss!) after the EP128 released, the EP64 owners can buy upgrading to EP128 in the Enterprise Services. At the top of house which label? 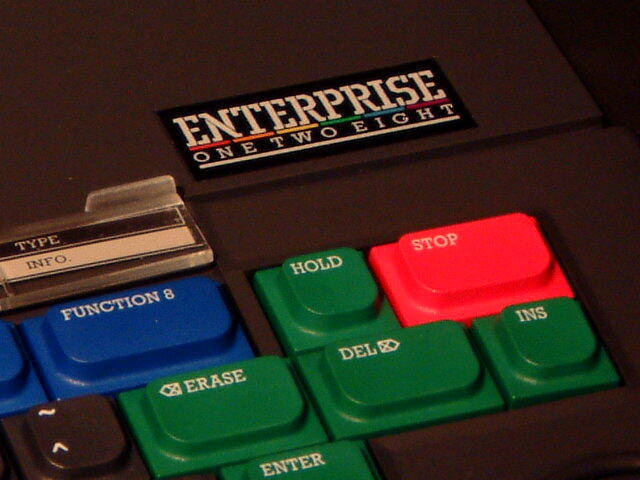 Enterprise 128K or Enterprise ONE TWO EIGHT? The case says "Enterprise ONE TWO EIGHT"
Photos of the motherboard are a little tricky - the raised RAM expansion isnt easy to move so cant get the motherboard out of the case without risking breaking it - however top photo attached. I think it is ISSUE 4 (or older). 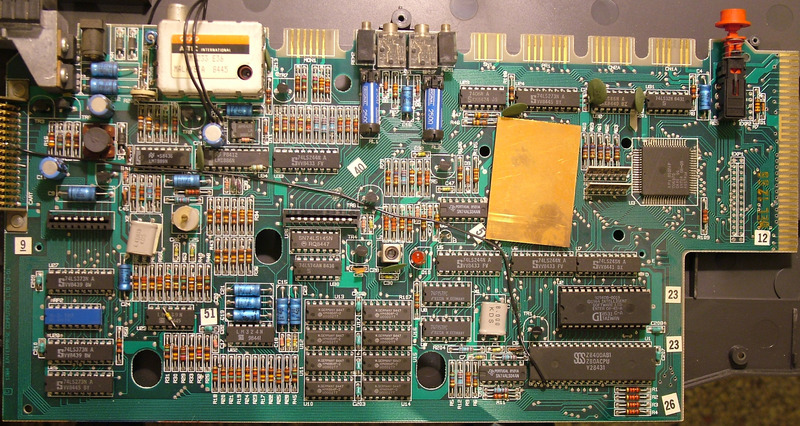 2) see the components at the near left of TV modulator. On your mb one capacitor not in the PCB, later assembled. 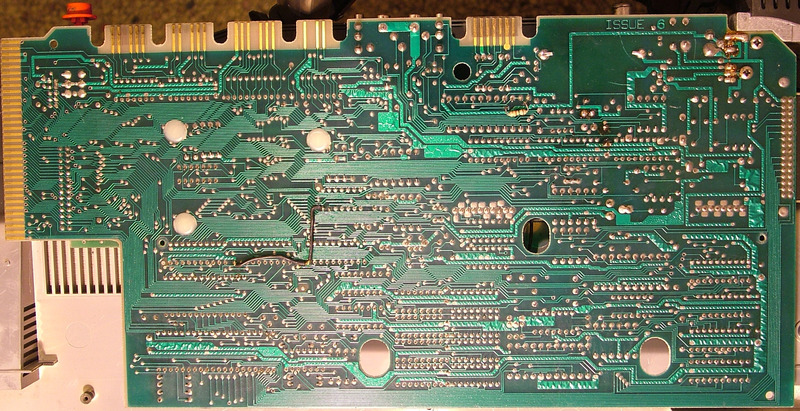 This is my ISSUE 4 mother board, it is have same later assembled capacitor. I think you have one of the first few EP128s! Do you have same in the spare motherboards? I own 2 Enterprise 128s, both UK models. An EP64 will be added to the collection, I just won that today. Pictures will follow as well, once I have the 64, I'll make some nice "family portraits"
Apart from Enterprise, my other vintage passion is MSX. I have a Goldstar FC200 MSX1 (my first computer), a number of MSX2 computers and lots of hard/software for it. I'd like to find more Enterprise peripherals, but these seem to be very rare. I shot some pictures of my enterprises today. See the attachements to this post. I have a UK machine and a German machine, this machine is a bit cleaner, but unfortunately misses the joystick partly. So, it looks like I have an old model and a later model. I'll be receiving a (UK, I believe) ep64 somewhere next week, wonder what the serial on that one is. And here is a hungarian (?) version. At least I think it's hungarian, although QWERTZ keyboard is also used in Germany. Maybe someone can confirm hungary also has qwertz? No, it is a German version! But the German and Hungarian keyboard layout also a qwertz. Officialy the Enterprise released with English, German, Arabic keyboards. You can switch the language with the :BRD and :UK commands. With this, can be used the :HUN and :UK command for the language switching. About 3000 machine sold in the Soviet Union. But don't know which version? It is exist a Russian keyboard version?